Most of us have been using Windows 7 for a while now. And though (arguably) it’s the best O/S to date, it still can be susceptible to problems and issues. Wiping your hard drive and performing a fresh installation can be a huge pain; but luckily there’s a way to repair a corrupt Windows 7 installation while keeping all your programs, personal data, and user accounts intact. With Win 7 you can perform an in-place upgrade installation to repair a flaky existing install. Though technically designed to upgrade older Windows operating systems like Vista, the in-place upgrade installation option can also be used to repair an existing installation of Windows 7. Now, this is usually a last resort. Keep in mind doing a sfc /scannow command is usually a much better first step. A source file check along with a chkdsk or scan disk can go a long way to getting you back on track before you jump into what we are going to show you how to do.Malware/virus checks are also a great next step, insofar as most bugs can make it LOOK like your system is unstable, when it’s really the malicious code mimicking system instability. OK…having said that, and you have done all of the above steps to no avail, here would be the next step: the repair/install. Let’s get this out of the way next: BACK UP YOUR DATA!!! This is critical, and do not say we never warned you. After you’ve backed up your system’s important data, we suggest uninstalling any third-party security software such as firewalls or antivirus applications. You can always put them back on after completing the repair process; but since you’ll be initiating this process from within Windows, you need to remove any security applications that actively scan files. You should also download and store all of the drivers that your system needs to function–especially the network controller, which tells your network adapter how to access the Internet. Having finished all of your prep work, you can now start the Windows 7 repair installation. You’ll need a Windows 7 installation disc that matches the version of Windows already installed on your system, and you’ll need at least 10GB of free space on the drive where you want to install the new version. The installation media (disk or flash drive) must be able to deploy a clean Windows installation, which means that custom recovery discs from your system manufacturer or another OEM probably will not work. To begin the repair installation process, insert the installation media and run Setup (if it doesn’t start automatically). In the Setup window, click the Install Now button, and you’ll have the choice of continuing the installation with downloadable updates or without them. If your Internet connection is working, you should probably choose to download the updates. Next you need to accept the terms of the license and then choose whether to perform an Upgrade installation or a Custom installation. You’re repairing a corrupt install, so choose Upgrade (the Custom option won’t save your personal files or settings). 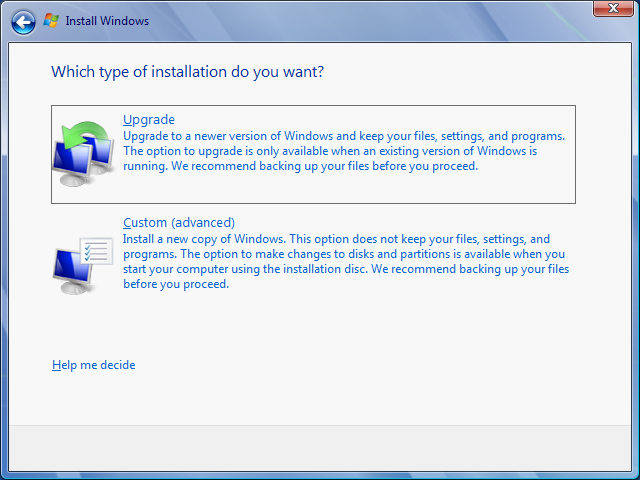 In the first phase of the install process, you need to choose the ‘Upgrade’ option to perform the repair install. After you’ve selected the Upgrade option, the installer will perform the compatibility check; your system should pass with flying colors, since you were already running the same version of Windows 7, but double-check to make sure that there aren’t any warnings. Once the compatibility check is done, press the big Next button, and the Upgrade/Repair installation process will start. The next few stages of the repair process don’t require any user intervention. The installer will gather information about your system, copy the necessary installation files, and then move any personal files or programs over to the fresh version of Windows 7. This process isn’t especially fast. The amount of time required will vary from system to system depending on how much data needs to be transferred from one Windows 7 installation to the other. Please know that most of your data and programs that were installed on your original copy of Windows 7 should make the move the new copy, a few things (like custom themes and sounds) will not. You will have to reinstall those after completing the fresh install. To complete the installation process, you will need to clear out the old junk data left over from your corrupted version of Windows 7. Windows will store this data in two system folders, labeled $INPLACE.~TR and $WINDOWS.~Q. If everything is working properly, you can delete these two folders, along with some other archived data. Follow the steps we outlined earlier to perform a disk cleanup, select Clean up system files, delete the two folders, and you’re done. Congratulations, you’ve successfully brought your Windows 7 PC back from the brink of corruption! Please make sure to keep this guide handy, in case you ever need to repair a corrupted copy of Windows 7 again.